British artist Peregrine Heathcote’s paintings contain iconic images that evoke nostalgia simultaneously reinventing a romantic era. 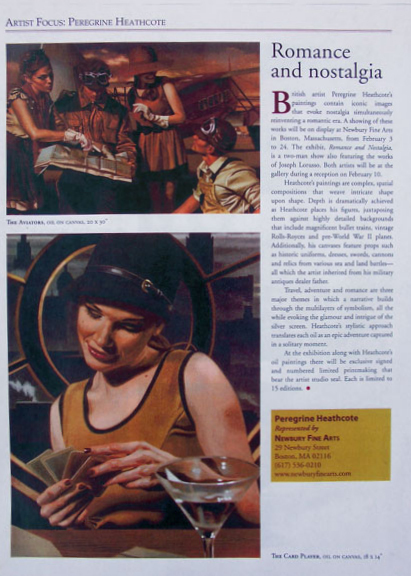 A showing of these works will be on display at Newbury Fine Arts in Boston, Massachusetts, from February 3 to 24. 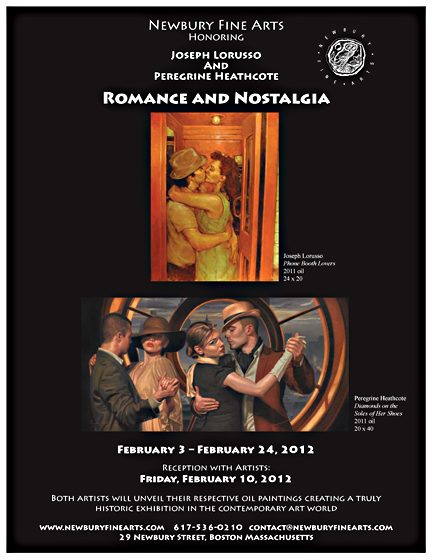 The exhibit, Romance and Nostalgia, is a two-man show also featuring the works of Joseph Lorusso. Both artists will be at the gallery during a reception on February 10. Heathcote’s paintings are complex, spatial compositions that weave intricate shape upon shape. Depth is dramatically achieved as Heathcote places his figures, juxtaposing them against highly detailed backgrounds that include magnificent bullet trains, vintage Rolls-Royces and pre-World War II planes. Additionally, his canvases feature props such as historic uniforms, dresses, swords, cannons and relics from various sea and land battles-all which the artist inherited from his military antiques dealer father. Travel, adventure and romance are three major themes in which a narrative builds through the multilayers of symbolism, all the while evoking the glamour and intrigue of the silver screen. Heathcote’s stylistic approach translates each oil as an epic adventure captured in a solitary moment. At the exhibition along with Heathcote’s oil paintings there will be exclusive signed and numbered limited prints that bear the artist studio seal. Each is limited to 15 editions.